Now the reality is, that in 2015 social media is so widely accepted that if an individual were to say that they don’t have some type of a social media profile, many of us would wonder ‘why not?’ The same applies for businesses. NOT having a social media channel can speak volumes to potential customers/clients. As a business you should put yourself in the position of a frequent u ser of social media. They see other brands regularly sharing posts and now presume that all reputable companies (besides Apple) must have social media channels. If not it will possibly raise questions of how serious are they? Do they have something to hide? How can I get in contact with them quickly? – (Emails have a 7 working day response rate.) Are they ‘modern enough’ for Social media? There’s no doubt that B2B companies have been slow in trying to catch and jump on the social media bandwagon. Social media monitoring organisation Brandwatch recently stated that a quarter of leading B2B brands have no social media presence whatsoever. Now, this may be down to the lack of a clear ROI , but if used right, B2B companies can capitalise from the use of social media. In 2011 1.8 Billion leads were created on LinkedIn, this means forming connections via social media can acquire new business for your company. 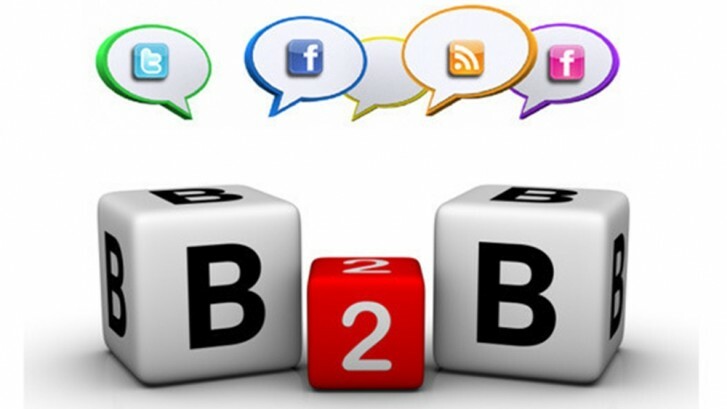 So what steps should a B2B company take when jumping into the world of social media? The first thing you should do is research and find out where your target market is based. Believe it or not this is the most obvious, yet largely ignored rule. Where B2C companies can market and advertise on any platform and just work on attracting attention, for B2B companies it isn’t quite as simple as that. It’s similar to being a classical musician trying to perform to an audience that likes rock music. Without a doubt the results wouldn’t be great as you’re on the wrong platform, but you wouldn’t stop playing, you would find an audience that would appreciate your work. For SEO purposes any platform could be beneficial, but you need to make sure you’re making the most of the channels that you pick. There are platforms like Pinterest and Instagram that might not be suitable for your business so be sure to do your research and evaluate first before you dive straight in. LinkedIn and Twitter can prove to be powerful allies when it comes to building awareness and generating new prospects. Statistics from The Content Marketing Institute found that 63% of marketers rate LinkedIn as the most effective for B2B social media. Sometimes it’s better to forget about B2B or B2C and think standard human to human interaction. After you’ve decided which social media platform you’re going to sign up to, here are FIVE TOP TIPS for attracting an audience, building numbers and keeping people engaged. 1. Dress to impress: Customise the design of your official presence(s) to reflect your corporate positioning. Look the part and you’ll attract interest. 2. Be convincing: Try not to treat your Social platform purely as a sales channel. It’s key that you give your audience something valuable. Social Media is competitive so you’ll need to find your voice and package your content into compelling, relevant information that will get people talking. Share your thoughts and opinions on relevant topics. Create and share downloadable content. Join in on group discussions. Doing all of the above will extend your content reach and grow your audience and in time your social channel will gain trust and will be considered as a resourceful hub. 3. Don’t be too self-centred: Ensure your B2B social media isn’t like a personal social media profile. The importance of being a good listener cannot be overstated. To indulge the analogy one more time, no one likes the guy who just talks about himself. Instead, be ‘sociable’. Stop Look and Listen to what your audience is saying so that you can spot patterns of common problems and trending topics. These are your opportunities to step in and provide help or even just get involved in general industry conversation. This doesn’t mean you should give away valuable information for free, but the more you get involved the greater the likelihood that your business will become a credible authority and potential customers will come to you when they need assistance. 4. Have a bit of character: Real-life selling is all about creating a rapport so why should it be any different online? You don’t get a second chance at a first impression so, make the first one count. Your target market will see through a thinly-veiled sales ploy. Let them see that you are human, share a joke or two, show them your team or share your experiences. 5. Like NIKE said ‘Just do it’ Don’t waste time wondering, Van Wilder once said ‘Wondering (worrying) is like a rocking chair. It gives you something to do, but it doesn’t get you anywhere’. Right now as you’re reading this, your competitors are already on social, entertaining your existing, as well as your potential, clientele. So like Nike said “Just do it”.